Stip is a single-page Hugo theme to introduce yourself. Stip is a single-page Hugo theme to introduce yourself. Add a portrait, an introduction, several links, and you’re set. The theme was inspired by Material Design’s tap target design pattern. An implementation of this design pattern. Put your own portrait in /static/images/portrait.jpg of your own site, and/or put your own background in /static/images/background.jpg of your own site and Hugo wil automatically use those images instead of the standard one. It’s not necessary to alter the theme. Stip will use the name and bio of the author that has been configured in the Author section of your site’s config.toml. Add the lines below to your config.toml to configure these. 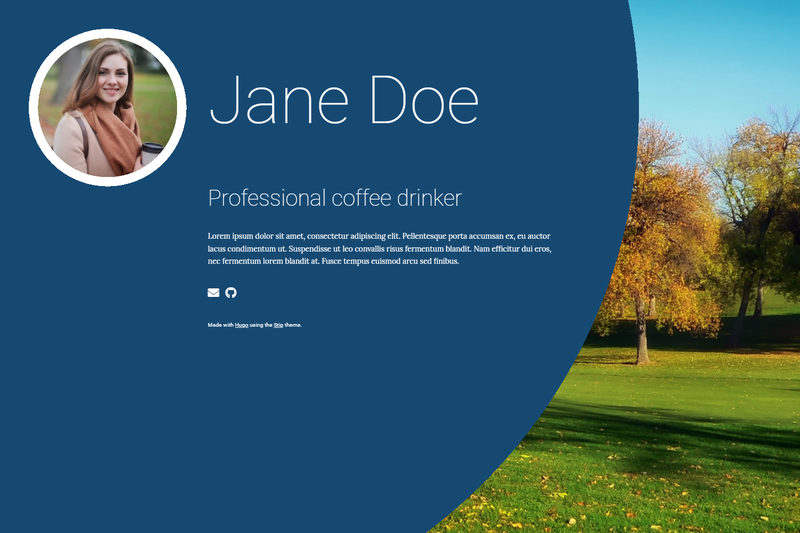 bio = "Professional coffee drinker"
Stip by default allows you to choose an icon from the brands set. Put the name of the icon in the icon parameter. This set is the default set because these links will mostly be used for links to social media. Feel free to submit pull requests for other translations of Stip’s texts. background: Th background color of the site. Note that this color usually will not be visible because of the background image. circle: The background color of the large circle. foreground: The color of the text and the border of the portrait. hover: The color of the hover of links. Stock portrait photo obtained here. Stock background photo obtained here.